Come visit, and take a walk around. You’ll find a vibrant shopping district and fantastic restaurants, windows to browse with lots to buy, and a lovely town park. 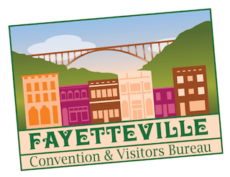 Surrounded by great places to stay, from hotels near the New River Gorge Bridge to tucked away cabins and cozy bed and breakfasts, Fayetteville has it all. When you visit Fayetteville, you’ll find a small town with a lot going on. It’s a great place to visit, on business or vacation- friendly folks, small town atmosphere, and world class thrills, right next door to the New River Gorge National River. Bring a taste for excitement and a desire to relax. We’ll do the rest.